Mix all the ingredients for the bottom layer and steam on high heat for 20 minutes. 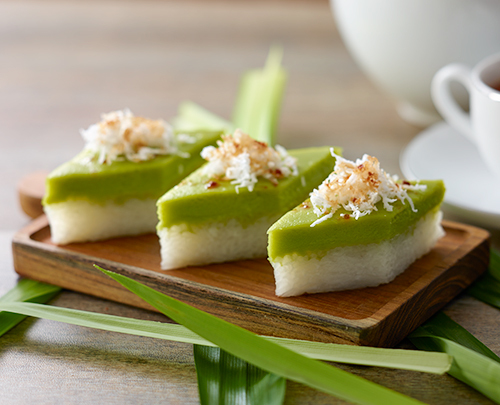 In the meantime, prepare the top layer by mixing the coconut milk, eggs, sugar, pandan juice and flour. Stir until smooth. Using double boil method, cook pandan mixture over simmering water until the mixture thickens slightly. After 20 minutes, take out the glutinuous rice mixture, stir and flatten it. Use a sieve to pour the pandan mixture on to the rice mixture. Steam on medium heat for 30 minutes. Leave to cool before cutting into diamond-shaped or rectangle-shaped pieces.